Mama Lily and the Dead is my book from the Bahamas for the Read The World challenge. It’s a collection of poems which tell Lily’s life story, running from ‘The Scotsman Gives Lily Her Name (1904)’ to ‘The Granddaughter Sings Lily Home (1994)’. I know Nico a bit via the world of internet poetry, and I’d read some of the poems before, or earlier drafts of them, so I had a pretty good idea of what to expect, but it’s still rather different to have them in actual printed paper form and read the whole lot in order. Anyway. As I was saying, I’d never read the whole sequence of Lily poems together before, and I thoroughly enjoyed it. At their best they have a sharp in-the-moment-ness, a vivid sense of being a particular point in time. And that brings with it a sense of place, emphasised by the use of Caribbean-inflected grammar. One thing which struck me as interesting, reading them, is as much a point about me as about the poems. Nico* has a particular stylistic quirk of using neologistic compounds — like, for example, using ‘bonechill’ as a verb — which just slightly makes my critical self uneasy; not because I object to neologising, but precisely the opposite: I have exactly the same tendency myself when I write poetry [perhaps I should say when I wrote poetry]. All the times I have come up with compounds and then cast a jaundiced eye on them trying to decide if I was being self-indulgent have apparently programmed a warning flag into my brain which pings up whenever I see them. I was going to type out an extract but actually there’s no need, because various of the poems have been published in internet poetry journals; so if you want to read some, just put Nicolette Bethel Lily into Google and it will offer you a variety to choose from. You could start with ‘The Preacher Man Saves Lily’s Soul (1914)’, for example. And a quick note on the actual physical book, which is rather lovely. It’s a numbered edition; my copy is 35 of 200. 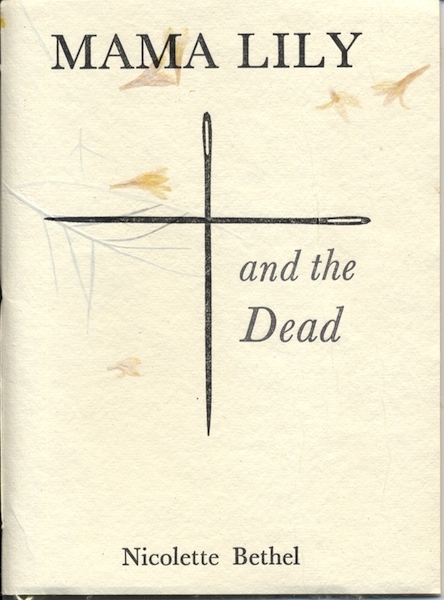 As you can see above, the cover is letterpress printed† on handmade Indian paper with bits of flowers in it. What you can’t see above is that it has endpapers, also handmade paper, in a sort of translucent acid yellow with thready bits running through it; or that the pages themselves are printed on high quality cotton paper. It struck me, when I opened the parcel and saw the book for the first time, that this is one future for printed books in a world of e-readers: to celebrate the physicality of them, to make them into covetable objects in their own right. Although, nice as it is to imagine a flowering of artisanal, boutique publishers producing books which are exquisitely designed and made, I guess it’s a red herring really. The point of books is the words, not the packaging. Any defence of printed books purely on the basis of their appearance is straying into the territory of interior designers who buy leather-bound books by the metre because they make a room look cosy. And actually I don’t think small publishers would be the winners in a world where books were bought for their beauty. I’ve read a lot of books from all kinds of small presses as part of the Read The World challenge, and Poinciana Paper Press is an admirable exception; much more often the books are rather badly designed. Which is understandable; a small press on a shoestring budget has to focus on what they’re good at, which is hopefully choosing, translating and editing texts. * And this is where the fact I knowontheinternet her comes in again, combined with the generally informal tone of blogging: ‘Nico’ sounds a bit offhand and casual, in the circumstances, but ‘Bethel’ would sound weirdly formal. Especially since I have actually mostly known her over the years by an internet pseudonym. Ah, netiquette. † Letterpress printed in, of all places, Camberwell. Not that I have anything against Camberwell; my sister lives there. And I think I had some art classes there as a child, though I don’t remember much about them except making some kind of collage out of bits of magazines, and eating pear drops. It’s just a long way from the Bahamas. Thanks, Harry!! I just found this, but am both pleased and flattered that you (a) ordered the book, (b) read it, and (c) blogged about it! The publisher, Sonia, is Irish-English-Danish-Argentine-Bahamian and was living in London when she began work on the book, hence Camberwell and the lovely paper. I will let her know you ordered, read, amd wrote about it. Cheers! Aargh, your comments were getting caught in the spam filter. Sorry about that!